Naomi: Come in. Oh, hello Thad. How are you, darling? I haven’t seen you in a while. Thad: No, no, it’s been a long time, Naomi. I’m great though, really great. How are you? Naomi: Fine Thad, thank you. What brings you into my office today? Thad: Well (Thad sits down and nervously picks at the lint on his pants) I was hoping that maybe you could write me in on Book 8? You haven’t finished it yet, have you? Naomi: No! I haven’t even started it. Thad: Well, you know…I wasn’t hardly in Golden’s Quest, just a cameo and then even less in Metamorphosis. Do you think, maybe, possibly you could give me something to do in the next one? Naomi: Well, I’ll think about it. The truth is Thad, you’re a nice guy and all and you were great in the early books but…well, you’ve gotten a bit tiresome and actually…nobody likes Gina. Nobody ever liked Gina. Thad: Hell, I don’t like Gina either! Can you write her out and just leave me? Naomi: No. I can’t do that. Look at the backlash I’ve had since I wrote out Caroline. I’ll ponder this and…wait, I have an idea. What if I write a prequel novella about you? We’ll make it when you were young, before you married Gina, maybe even bring your ex-wife Leslie into it. It could be about how you ended up leaving Earth and going to Rozari where of course, you meet THE MAN. Thad: That’d be cool but do we have to bring in Leslie? I mean, nobody likes Gina, just wait until they meet Leslie. They’ll hate her. Naomi: Let me work on it. I’ll call you. Naomi: I know, Sweetie. Give me a few days. Thad leaves. A few minutes later the door opens again. Naomi: Sweetheart! Why am I so fortunate to be graced by your presence today? Senya: Have you started Book 8? Senya: I don’t want any more Viagra jokes. Naomi: There was only one. Senya: I don’t like being old. Naomi: None of us do but you know, time has to happen in the way it has to happen. Senya: I am not going to metamorphose into any more pathetic geeks. Senya: I want you to kill Katie. Senya: If you don’t, I will. Naomi: Now hold on. I admit she was very annoying in Metamorphosis but still, you two have a long history together. Senya: I would rather have Hannah from the Journey series. Send Katie there and give me Hannah. Naomi: Sorry, Cupcake, but I’m not getting started with that oedipal theme. Let me work on Katie. I’ll calm her down and you’ll see, things will be better. Senya: How many more books are in my contract? Silence. Another cloud of smoke passes in front of Naomi’s face. Naomi: (smiling while gritting her teeth) Sugar Plum, do you remember what happened to you in book 1? How about books 3 &4? Do you want to go through stuff like that again? Senya gets up and leaves, slamming the door. Naomi: (sighs) I didn’t think so. 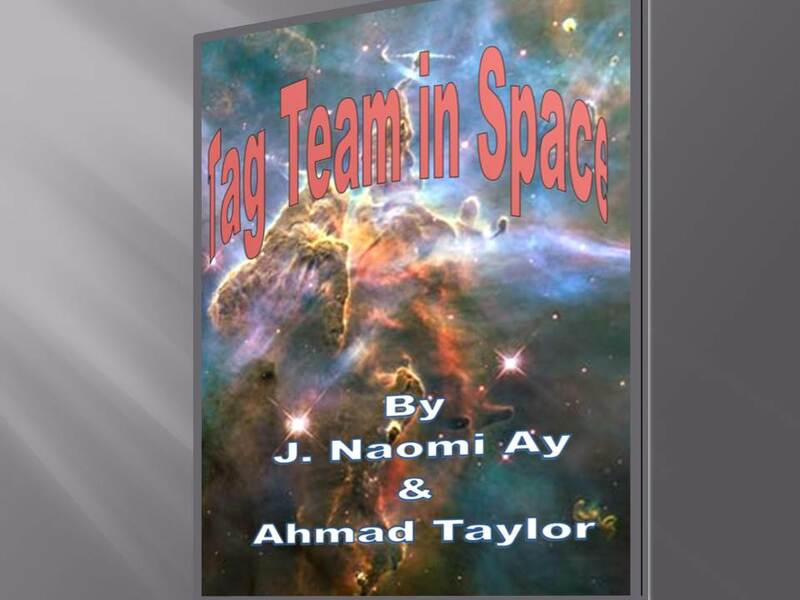 Tag Team in Space continues! Episode 19 – Jerry and Fogweet find what??? “What is it?” Fogweet asked burying his big eyes in my hair, getting my head all sticky as if it wasn’t dirty enough. “Okay.” He scampered off while I reached into my bag for my stethoscope, otoscope and knee hammer. I also opened the app on my iPhone that did an instant PET scan and MRI to see if there was any life left in this thing. “What do you think it is, Doc?” the cop asked while trying not to look but somehow couldn’t seem to turn his eyes away. “They look kind of the same,” the cop continued, squinting as he watched me work. “Fogweet don’t want knee hammer!” He threw it down and launched into a tantrum, stomping his feet. “Fogweet want pretty light. Fogweet get one for my own.” Then he scampered down the conduit toward the lift tubes. “That,” Fogweet replied from the lift shaft. An emergency beacon was flashing red like a nun buoy light. It illuminated footsteps in the dust, a couple which looked like a size thirteen. Planet Earth will experience a penumbral eclipse on Nov 28. 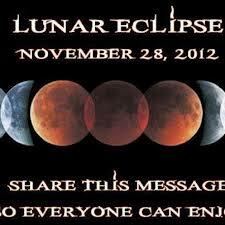 The last lunar eclipse of 2012 is a deep penumbral eclipse with a magnitude of 0.9155. It should be easily visible to the naked eye as a dusky shading in the northern half of the Moon. The times of the major phases are listed below. Bette and I chat about ME today. Enjoy! Generally around our house, Thanksgiving is a chore rather than a celebration. For me, it’s a lot of cooking and cleaning for others and will undoubtedly include a migraine and several doses of Excedrin before Sunday. For my boys, it’s a dutiful and somewhat unwelcome trek home to visit the parents and younger sibling they only just now managed to escape from. 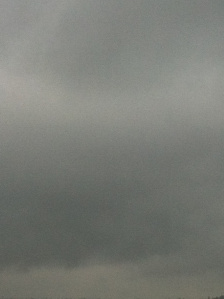 In the corner of the world where I sit, the sky is a gloomy grey. The water is throwing up white caps and the sand is damp and dark. A high wind advisory was issued for tonight which may mean our Thanksgiving will once again be powerless and unheated. I don’t have to work today but business is lousy anyway. Layoffs are impending at companies all over and I constantly worry for the boy who just started the U. What kind of job will be there for him when he is done? The older boy had a trip planned to Israel next month and the only reason he has not yet cancelled is because I am telling him to do exactly that. I suspect he’ll come to the right conclusion once he gets over his aversion to his mother’s advice. It saddens all of us beyond measure that he must postpone this journey due to yet another war. The most horrific election in my lifetime has just concluded and my guy lost although he was never really my guy, as none of them ever really are. It’s not the person nor the party that has made this exercise in civic duty so futile, it’s the ingrained corruption of the system by all sides desperate for power and I am not certain that a remedy for this will ever be found. So with all that bad, what is there really to be thankful for? I have to make a list now to cheer me up and give me a reason to move forward ringing in those bells of holiday bliss. 1. I am thankful for my family most of all. My husband, though he aggravates and annoys and at times makes me slap my head and wonder how I could possibly survive another twenty-seven years with him, is still here and still my best friend though he wonders the same thing about me. 2. My children who are all nearly adults have turned into the most beautiful, intelligent and incredible people alive. 3. My mother and my in-laws who keep moving forward, staying healthy and enduring even when the obstacles seem too big to me. 4. I am thankful for the memory of my father who sometimes visits me in my dreams such that when I wake up, I have to remind myself that no, I am no longer 8 or 18 or even 28 and these conversations that we had took place now decades ago. 5. I am thankful for our friends who will join us on Saturday. A party with them is a pleasure and not a dutiful chore. Three in our group had surgeries this year, two of cancers. One may not come again because she is too ill. I am truly thankful that for a least a little while, we all had the opportunity to ride this planet Earth together. 6. Lastly, I am thankful for all of you. This past year has indeed been a ride when on a whim, I let the world see something that I had been holding deep inside of me. It is nice to know that what I thought was a psychosis is actually a socially acceptable form of behavior called ‘writing fantasy fiction’. Thank you for reading and thank you for listening. God Bless and may you all have a joyful holiday season. must be the holidays coming up or something. I wonder if I’ll have to take them all for haircuts next. Check out My Enemy’s Son’s new jacket. A Two Moons of Rehnor prequel novella. Meri was born with a beauty unmatched though she lived in a decrepit flat in the old city. Her sister, Jayne longs for a life away from the streets and the mother who calls herself a nurse for giving treatments to men. Jayne and Meri venture to the Palace hoping for positions as maids. One girl is hired on, the other is turned away though neither will end up where they expected.